I think it would be interesting to see other members equipment setup. And of course here in the South you've got to have that fan going for relief from the humidity and to keep the night bugs at bay! Thanks for the information. It is good to read that there are still a LS-users here in the forum. What success there with the accuracy of tracking and how accurate the alignment? A star or two star alignment? 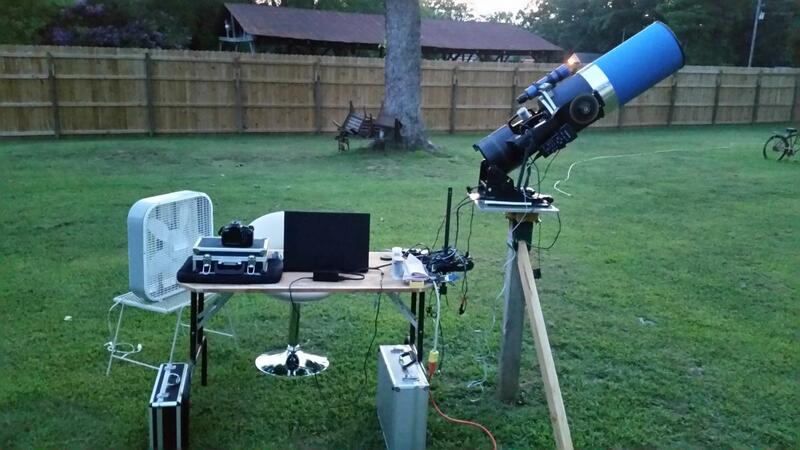 I'm currently working on a better azimuth adjustment in my setup. I just saw that there is a LX90, forgiveness, came out from an LS, but it is good if this show user their equipment. I use a 2 star alignment in polar mode. I am still working with the setup to attain better tracking. I am only getting about 25% of the pics I am taking without trails or movement. I don't know if this is normal or not but I had hoped that tracking with a wedge setup would have been better. I do hope others will post pics of their equipment. 1. Set the wedge on the latitude, 90 ° minus latitude of your location is equal to the angle at which the wedge has to be set! For my site are the 90 ° minus 48.54 ° equal to 41.46 °, the angle of the wedge. 2. Polarstern bring the center of an illuminated eyepiece and Polaris exactly in the center of the polar scope. This I do with the polar adjustment of the wedge and the azimuth adjustment of the telescope. If Polarstern in center of the telescope and the Polarstern in the center of the polar scope, then LS switch and bring telescope with the polar adjustment and azimuth adjustment Polaris congruent with the engraving in the polar scope. 3. Confirm with Enter. Telescope moves in the azimuthal direction to stop. 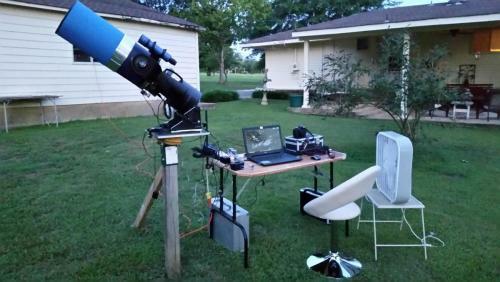 Then bring the Polarstern with Handpaddle the center of the illuminated eyepiece and press Enter >> telescope moves to the first alignment star >> bring Handpaddle the Center and then press Enter. Telescope drives for the second alignment star >> bring Handpaddle the center and again press Enter. Done !! And now I can watch. I've Vega (currently at the zenith) with an exposure time of 3 minutes with the Canon 1100d exposed without any star trails! 4. Conclusion: I am very satisfied with the equatorial orientation of the LS. Another big plus for the equatorial mount of the LS is, I have no problems with the accessories on the tube, thus no collusion with the frame !!! I'm currently working on improving the azimuth adjustment (currently goes something heavy and difficult). I'll report back. Thanks so much for your alignment info. Just to be clear, you have a 6" Light Switch telescope mounted on a wedge? My apologies Wolfgang. I did see your post and liked your setup. I especially liked the weight system you made for it. I think I will examine my set-up more closely for weight distribution and maybe do a PEC training. I did that once but Stellarium did not perform well after the training. I will let the LX90 do the guiding next time. Thanks again for your input. Unfortunately I can not see how the azimuth setting and locking to take place from the pictures. For a proper weight distribution in my opinion, a tripod is essential, as already the stand design with the three legs ensures reliable weight distribution and during the work of the telescope this can not tip. WOW! Nice set-up Mark. Thanks for sharing. One more question . . . Are you using a Polar scope as a finder scope?